Geraniums are popular flowers that can thrive in pots or a garden. Geraniums are perennials, which means they can flower for more than one season, but some types of geraniums are more fragile and cannot survive cold winters. 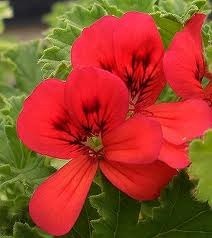 All types of geraniums need consistent amounts of fertilizer, especially those that are grown in baskets and pots. Mix one half ounce of 20-20-20 fertilizer, which is water soluble, with one gallon of water. Feed your geraniums fertilizer every one to two weeks. The numbers of the fertilizer, such as 20-20-20, tell you the percentages of nitrogen, phosphorus and potassium that make up the fertilizer. Geraniums need plenty of nitrogen in the soil or else they may turn yellow. Test the pH level of your soil if you planted your geraniums in the ground or in pots. Geraniums grow best in soil with a pH level of 6.5 and will not produce healthy-looking flowers in a pH below 5.5. Add one half teaspoon of dolomitic limestone to your fertilizer to raise the pH level of the soil if the pH level is not in the desired range.